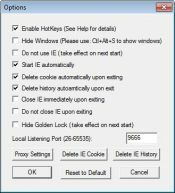 Ultrasurf is a great solution that will be the guardian of your privacy online by hiding IP addresses and clearing browsing history and cookies. It has grown from a tool designed to provide users in China with the possibility to access blocked websites under the safety of anonymity to a worldwide used to circumvent internet censorship tool. Bypassing internet restrictions also involves the encryption of online communication. The application hides your IP, so it is no longer reachable by companies trying to advertise their products, as cookies are removed from the servers used to redirect traffic. Loading time for visited websites won’t decrease considerably with this encryption tool, as all pages are compressed and stripped down of third-party content. The software needs no installation. All you have to do is to unzip it and run it. 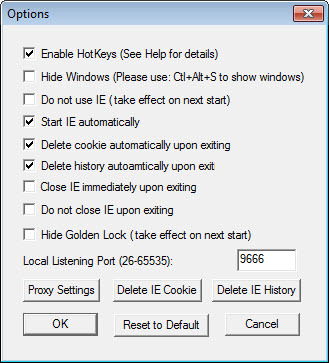 The options include capabilities like: the ability to define proxies, local port to be used, automatic cookie and history deletion, automatic start and stop of the internet browser, hotkeys setup.